The remaining PA terrorists will be released on October 29, December 29 and March 28, claims Minister of Prisoner Affairs. The Palestinian Authority’s Minister of Prisoner Affairs, Issa Qaraqe, on Friday announced the dates for the release of terrorist prisoners from Israeli jails, reports the Ma’an news agency. As a gesture to PA Chairman Mahmoud Abbas to get him to return to the negotiating table, Israel has agreed to release 104 terrorists, most of whom were jailed before the 1993 Oslo Accords, in four stages. The remaining prisoners will be released on October 29, December 29 and March 28, Qaraqe said at a meeting with prisoners' families, according to Ma’an. The minister met with PLO negotiator Saeb Erekat and the PA Prisoners Society director Qadura Fares in Ramallah to discuss a strategy to improve prisoners' lives after their release, Qaraqe said. The first batch of 26 terrorists was released on August 14, hours before peace negotiations resumed in Jerusalem. 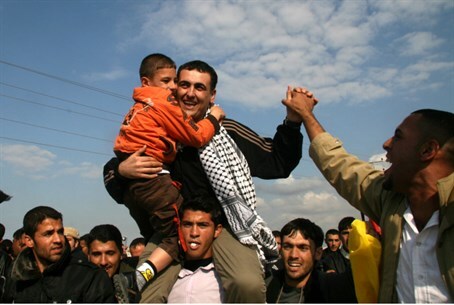 15 of the 26 were transferred to Gaza, and another 11 were received by Abbas in Ramallah, to scenes of public jubilation. "This is the first group," Abbas told the crowd at the official welcoming ceremony.